20th June 2016 marks World Refugee Day. Here I write on the children living in Aida refugee camp protecting their community, the impact of violence and “Beautiful Resistance” – a philosophy which encourages non-violent expression and the pioneering of life through art. Levels of violence in the West Bank is at its worst since 2006. The United Nations Relief and Works Agency (UNRWA) report 44 children were killed between Oct 2015 and March 2016, – twice the number of 2013 and 2014 combined. The number of Palestinian attacks on Israelis increased too killing a total of 34 Israelis. Last Wednesday saw one of the most deadly attacks in which 4 Israelis were killed in a market in Tel Aviv. Last month I travelled to Palestine and on this day was the commemoration the “Nakba (catastrophe)” when 700,000 Palestinians were expelled or fled from fear from their homes in 1948, thousands of whom are still living in refugee camps. By the afternoon demonstrations had ended so a friend and I travelled to Aida refugee camp with a man named Abdelfattah Abusrour. Pulling into Aida something burning immediately hits you. It’s the aftermath of teargas. The atmosphere shifts from the surrounding Bethlehem – you feel the might of the separation wall towering over the camp. I see the “The Train of Return” that I saw earlier in the news that morning lying by the side of the road. Built by volunteers, it has listed upon it the names of the refugee camps Palestinians fled to and have been living in for 68 years. A giant key lies on the gate leading into the camp- this is symbolic of the Palestinian cause to return and is found on every poster advertising the demonstration in the lead up to this day. An empty teargas canister lying on the ground catches my eye. I pick it up and its silver shine tells me it hasn’t been here very long. A young boy sees me. I drop it. I don’t want him to think I’m playing with it. My attempts are in vein – I watch him pick it up and re-enact smoke gushing from the canister. Shots fire. We look up the road we are standing on. It fills with smoke. And you begin to feel it again, the burning. We are being shot at with teargas by Israeli forces. A child instantly runs across the road towards the teargas. What is he doing running into the clouds of smoke?! He picks up the canister and throws it with all his might before running as fast as he can away from it. You then realise exactly what he’s doing – he’s protecting his friends and his community. Depending on the draw of the winds, the long-ranging fumes easily can find their way seeping through the camp which is home to 5000, causing adverse effects to particularly the pregnant, elderly and those with respiratory problems. In October last year an eight-month-old boy, Ramadan Thawabteh died from asphyxiation after Israeli forces fired tear gas in Bethlehem during violent clashes. More shooting. Closer. I wonder what to do. Do I tell the children to stay away? Do I leave? I just want to pick them up and take them somewhere safe. As it turns out, these kids are the ones who know what to do. I turn my camera on. As tear gas keeps shooting down the road, the children keep running towards it. I can’t help but think what harm the gas is doing inhibiting their little lungs. Where they do not have time or energy to pick the canister, they instead try to kick them away. Checking footage from two minutes before the shootings the road was quiet. Looking up when the shooting began I see in distance, around 20 metres down, I see young men, slightly older, perhaps 15-18 now throwing rocks against the metre-thick concrete separation wall. They may have been the source of contention. But I still can’t help but think, the response is firstly completely disproportionate because they were throwing stones at a concrete wall, but secondly, the younger boys who were targeted and pushed back into the camp by the gas, were doing absolutely nothing wrong. I’ve wondered many times how to cover this “fairly”. This perspective is only my own experience, but what did it look like from the other side – what did they see? Part of me could be arrogant and simply say “well it’s difficult to ask for comment from someone shooting at you with guns”. But with honest intentions to understand and report, I contacted the Israeli Defence Force for a comment but received no reply. Those children posed no threat. They were simply playing amongst themselves, but were shot at with teargas. I watched them walk and ride their bikes back into their camps hiding their little noses under their shirts, some of them crying from the fumes. It’s as though they were being taught a lesson that you must stay inside or be prepared to get hurt. Once it has found its way inside of you, teargas can stay in your body for about a day. But the bravery and protective nature those young children had for one another and their community, will linger in your soul forever. Abusrour tells us this cycle of teargassing and stone throwing will continue and if the Israelis become aggravated, they will move into the camp and cause disruption as punishment and warning. Returning to our hotel, news came that another delegate was caught in teargas. 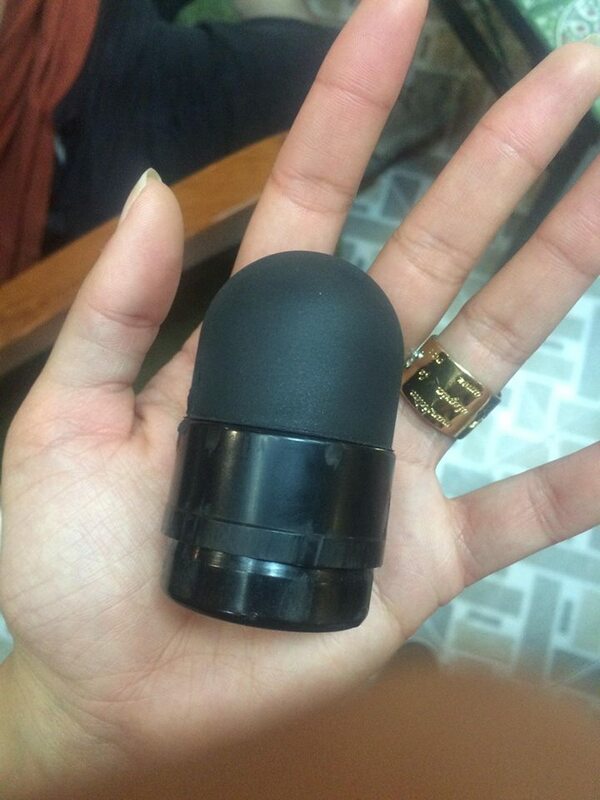 When I see him, he places a rubber bullet in my hand “This is what they shoot at kids” he tells me. Later that evening, he pulls it out his pocket again – it was telling of the impact this had on him. He tells us how the children offered him guidance as his eyes and face burnt immensely. They stopped him throwing water in his eyes and gave him alcohol pads to hold under his nose to keep his airways open. These kids are clearly wise. But it’s the kind of wisdom you wish they never had to know. 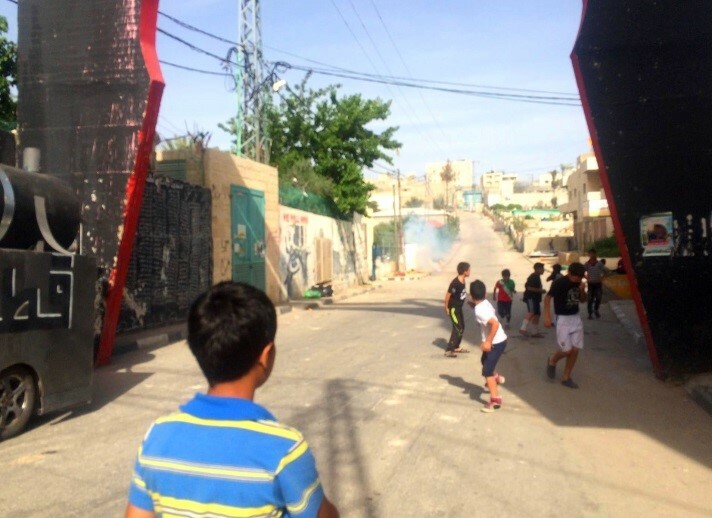 What physical and emotional effect does being immersed in violence and occupation have on children? On 18th April, the day I booked my flights, a 19 year old committed the first suicide attack on a bus in Jerusalem in years. That man was from Aida and the son of Abusrour’s cousin. The stark reality is that some entrenched in atrocities may commit atrocities of their own. UNRWA has programmes to support refugee children aimed to mitigate impact. Positive responses have been shown and reported by parents however maintaining this for children on their one-day programmes proves difficult. 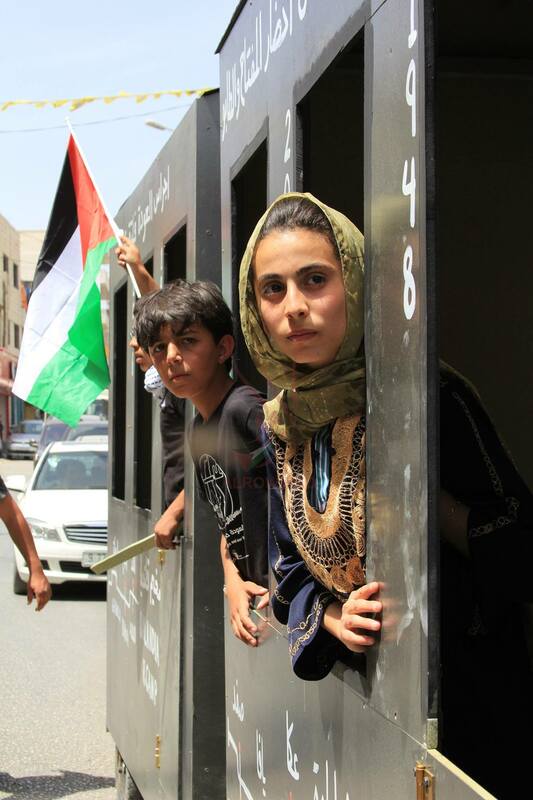 If you ask the youth what aspirations they hold, a common response is “to free Palestine” but to tease out personal dreams and ambitions is difficult, they have often become lost. That is what the occupation does, it takes away dreams, desires and the sense of individuality. Across Palestine, in streets and buildings you will find photos of those who have been killed, who have killed, or have been imprisoned. 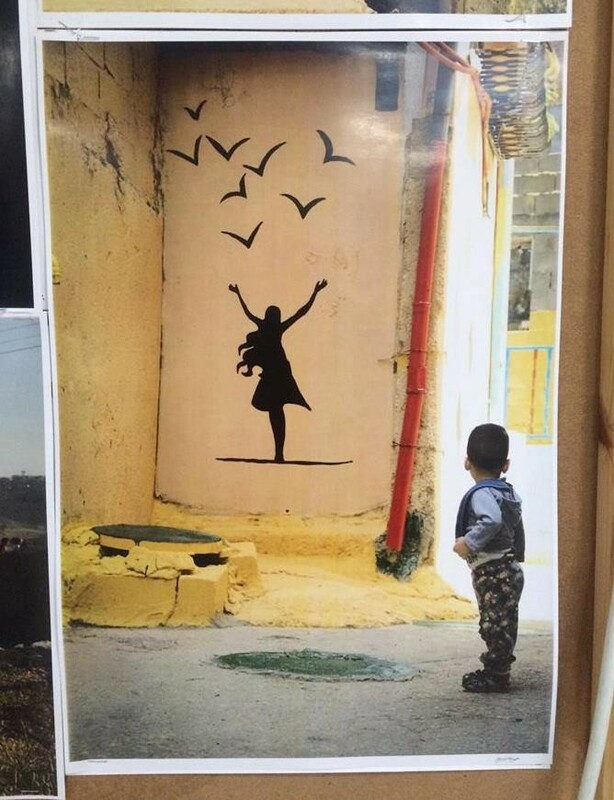 Establishing routes for young people to take control the way they want to and express their feelings through art is the philosophy of a “Beautiful Resistance”. In his talk to Dar Al-Kalima’s Art and Resistance conference, Abusrour spoke of this philosophy that brings the youth to be pioneers of life, not death. And that life is resistance. Theatre, arts and culture are the means in which “Alrowwad Centre for Arts and Culture” set up by Abusrour in 1998 pursue the route non-violent expression. After the incident with teargas, Abusrour took us to Alrowwad where we found a colourful library filled with books, toy and and a music room. “The furniture is childproof and easily mobile” he tells me. Open 6 days a week, it serves as a safe space for those from kindergarten age to adults to come and learn. Approximately 6,000 people per year engage in the Alrowwad Centre on its developmental programmes in Aida and 30,000+ on its mobile programmes. Downstairs we find a full theatre where performances and rehearsals take place. Abusrour tells us his concerns that young people may start to believe themselves as terrorists and leave behind their art when Alrowwad’s international theatre performances are cancelled because someone raises concerns to venues that “Palestinians are terrorists”. Photographs line the walls. 15-30 students are enrolled on a 3 month photography course at Alrowwad. Students here stress the importance of being behind the camera as well as in front to effectively tell their story in the way they see it. Getting materials for a radio studio was expensive but students found their way around it carefully lining the walls of the studio lining with carefu lly thick carpet to make it soundproof. 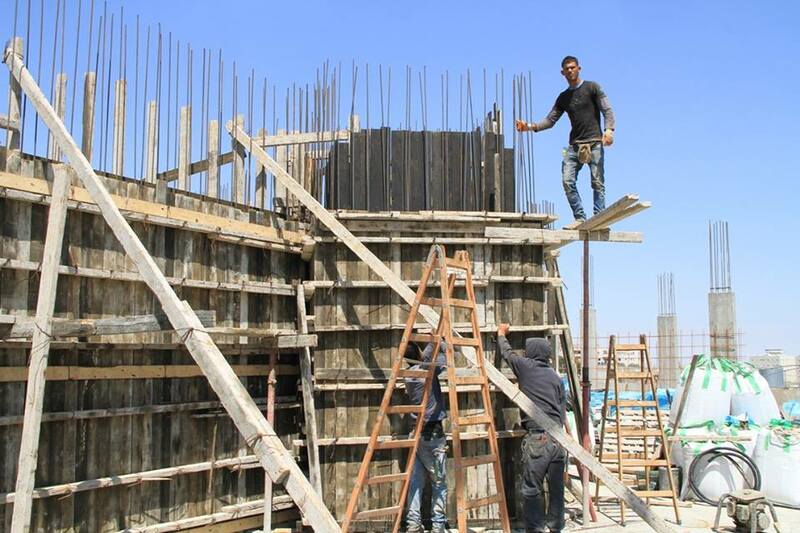 The resourcefulness and determination is reflective of the nature of Palestinians. The vast range of activities at Alrowwad has the capability of capturing anyone that comes into contact with it. Abusrour tells us the centre is expanding with a brand new building currently being constructed. Abusrour does not want people to look at Alrowwad or Palestine as a humanitarian cause, but a place for meaningful working partnerships to be built. In the centre’s office hangs a Norwegian flag in respect of the partners Alrowwad has in Norway. The Norwegian children from six schools are Alrowwad’s biggest partners and come to visit every year. ng from the 13th August to the 5th September 2016 in locations including Edinburgh Fringe Festival and St Paul’s Cathedral. They also plan to meet the Foreign & Commonwealth Office and with young Jewish and Muslim people who are advocates for a just peace in Palestine and Israel. These programmes are treating symptoms of a larger problem. As the briefing note explains that robust political action is also needed to prevent further escalation including addressing the occupation, use of force directed at children, collective violence and thorough investigation of human rights violations. Alrowwad, Al-Saraya and UNRWA play a significant role to reduce the impact of violence and enable Palestinians to enjoy beautiful offerings such as art that are intended for all. Exploring partnerships is the way forward for anyone willing to help. Supporting the Palestinian refugees tour in the UK is a perfect place to start. Previous Post What you didn’t see.